Bill Maher. Image courtesy of YouTube. Bill Maher is a master skewerer. Now he’s tilting his prongs toward your smartphone. Or, more precisely, the people who keep you gazing into it — comparing them to cigarette makers. 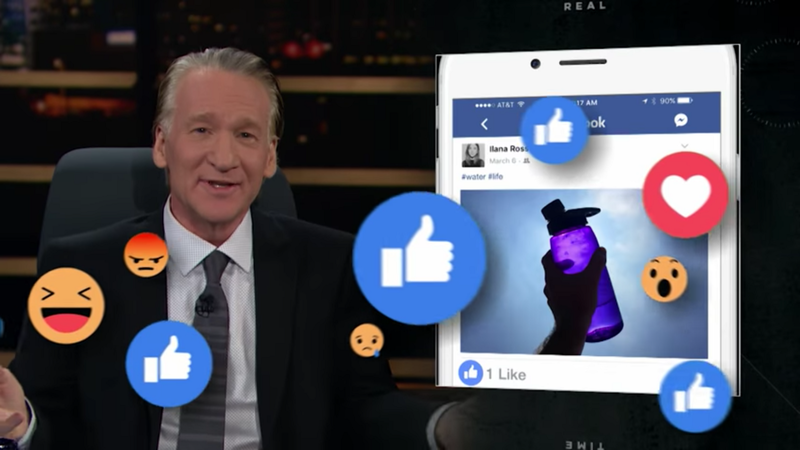 On Friday’s episode of Real Time, Maher declared a “new rule”: tech tycoons need “to stop pretending that they’re friendly nerd gods building a better world,” he said. They have to “admit they’re just tobacco farmers in T-shirts selling an addictive product to children,” he added. Maher referenced a 60 Minutes interview with Tristan Harris, the former Google design ethicist and co-creator of Time Well Spent, the movement to align technology with our humanity. It’s “brain hijacking,” Harris likes to say, and your phone is a slot machine in your pocket. Same with the multi-billion dollar social media companies. “Let’s face it,” Maher says. “Checking your likes is the new smoking.” And the more you scroll, the worse you feel.